LAWPRO provides primary errors and omissions insurance coverage for Ontario lawyers, Excess insurance for law firms and title insurance across Canada. We are a professional liability powerhouse, committed to the values of professionalism, innovation, integrity, service and leadership. Before LAWPRO was incorporated as an independent insurance company, liability insurance for the Ontario Bar was in a different situation. At the time, the fund established to pay for professional indemnity claims against Ontario lawyers was underfunded by over $200 million dollars. The resulting crisis led to a task force which recommended the creation of the organization now known as LAWPRO, a highly specialized, efficient insurance company operated independently from the Law Society of Ontario. Specializing in insurance for the legal profession means the company has a deeper understanding of claims trends and is well positioned to identify and cope with emerging risks including sophisticated mortgage frauds, cybercrime, new technologies and the evolving nature of legal work. Operational and governance separation from the Law Society allows us to set our own priorities for a secure and appropriately priced professional liability program. While LAWPRO maintains an intimate understanding of the role of and challenges faced by the Bar, we can also focus on broader insurance industry issues including solvency and effective claims management. 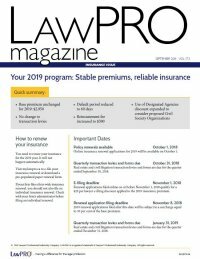 LAWPRO charges a lower premium today than it did in 1994. By minimizing costs we can offer the greatest possible savings that the size of the premium pool and solvency requirements allow. Financial stability comes from prudent investing, accurately forecasting expenses, controlling operating costs, and carefully managing claims. To achieve these ends, LAWPRO relies on the expertise of our staff, professional investment managers, and advisors. In recognition of our financial strength, we have consistently been awarded an “A (Excellent)” rating by A.M. Best Co, a leading rating agency.